ERIE — Right-hander Chad Zurat (Clearfield) chalked up 15 strikeouts, one shy of the Penn State Behrend record, and extended his streak of scoreless innings to 21 by shutting out Pitt-Bradford at Behrend Field Monday afternoon. The hard-throwing right-hander issued only one walk and allowed just two singles in the 3-0 win that clinched second place and a first-round bye in the Allegheny Mountain Collegiate Conference Championship Tournament. Zurat whiffed eight Panthers in a row from the fourth through the sixth innings, including the rare accomplishment of four in the fifth frame when one victim chased a wild pitch and reached first base. He was so dominate Pitt-Bradford had only two base runners until the seventh inning, when a hit and the walk posed a threat. Zurat punctuated his gem by freezing a Panther on the third strike for the ninth time. 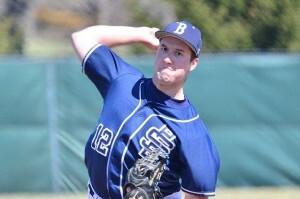 The school’s baseball website branded his performance as one of the “greatest” in Behrend history. Last Wednesday, Zurat pitched six innings in a combined shutout with Andrew Quiggle as the Lions trounced Medaille 14-0. He surrendered three hits, struck out five and walked two. Those two efforts lowered his earned run average to 2.22, fourth lowest in the AMCC. Zurat (6-2) is 5-1 with a scintillating 1.00 ERA in his last six starts. He’s fanned 40 and given up 25 hits and four earned runs in 36 innings over that stretch. His season stats for 48-2/3 innings show 37 hits, 15 runs with 12 earned, 48 strikeouts, 12 walks and four hit batsmen. Zurat, one of three Lions honored on Senior Day Saturday when the Lions hosted Pitt-Greensburg, is tied for third in strikeouts and tied for fourth in wins in the AMCC. The Lions (25-11) swept doubleheaders from Medaille, Hilbert (N.Y.), Pitt-Greensburg and Pitt-Bradford in six days for a 13-3 finish in the conference. They will travel to Pittsburgh next week for the AMCC Final Four at regular season champ LaRoche’s home diamond. GREENSBURG — Freshman Kurtis Krise (Bigler/Clearfield Area H.S.) evened his record at 2-2 with a complete game in a 13-6 victory that gave Penn State Altoona a split with Pitt-Greensburg in an Allegheny Mountain Athletic Conference doubleheader on Tuesday, April 22. Krise surrendered 11 hits and four earned runs while striking out two and walking none in seven innings. He has appeared in seven games with three complete games in five starts, pitching 31.2 innings and allowing 40 hits and 16 earned runs. He has 16 strikeouts and seven walks. His 4.83 earned run average is tops for the 15-23 Lions, who will be heading into the AMCC Championship Tournament as the No. 6 seed Saturday after finishing their AMCC schedule at 8-8. ALTOONA — Senior outfielder Sam Gardner (Curwensville) enjoyed his first three-hit game of the season Saturday in Pitt-Bradford’s 12-11 nightcap loss to Penn State Altoona at Stewart Athletic Field. He drove in runs with a fifth-inning single and seventh-inning double and scored a run as the Panthers opened an 11-6 lead, but the Lions rallied in the bottom of the seventh to force an extra inning and then won in walk-off fashion. Pitt-Bradford (19-12) was victorious in the opener, 7-6, and wound up tied for fourth place in the Allegheny Mountain Collegiate Conference at 9-7 after losing two close games at Penn State Behrend, 3-0 and 3-2, Monday. The Panthers will enter the AMCC Championship Tournament as the No. 5 seed and play Pitt-Greensburg Saturday. Gardner is hitting .328, second on the team, in 23 games. Including among his 28 hits are eight doubles and one home run for a 508 slugging average that also is second among the Panthers. He has 15 RBIs and 12 runs scored. CLARION — Junior second baseman Derek Danver (Clearfield) collected four hits, drove in one run and scored twice last week in the three Pennsylvania State Athletic Conference West Division doubleheaders that closed the season for Clarion. The Golden Eagles dropped two games to Slippery Rock and four to Indiana University of Pennsylvania to finish 8-30 with a 5-23 PSAC West record. Danver, a starter at second base or as the designated hitter in all but one of Clarion’s games, also made his first collegiate pitching appearance at Indiana Saturday, relieving in the sixth inning of a 22-4 defeat. He gave up a walk and an RBI single before registering the last two outs. Danver was 32-for-119, a .269 average, with three doubles and two triples, drove in 10 runs and scored 12. He drew only three walks but was hit a team-high eight times. An injury prevented Caleb “Ben” McGary (Curwensville) from pitching in his senior season. CRESSON — Freshman Heather Picard (Clearfield) added to her impressive rookie season credentials for Mount Aloysius with two wins in five appearances last week as the Mounties ended the regular season on a high note with a 5-1 record and secured the No. 3 seed for the Allegheny Mountain Collegiate Conference Championship Tournament. Picard was the winner in the 10-2 finale Sunday against Medaille at Buffalo, N.Y.
She fired a three-hitter and struck out seven with no walks in the five-inning Mercy Rule victory that gave the Mounties a 13-5 record and a tie for third place in the AMCC. Picard pitch both games in a split with LaRoche at Pittsburgh on Wednesday. She worked 1-2/3 scoreless innings in relief of winner Kelsey Ickes in the 12-4 opener, allowing two hits and striking out one. Then, she started the nightcap, pitching five innings and had allowed six hits and two earned runs when she departed with the Mounties ahead 5-3. She wound up with no decision, for LaRoche came back to pull out an 8-7 win. Mount Aloysius stepped out of the AMCC to sweep visiting Grove City Thursday, and Picard hurled a seven-hitter to win the 6-4 opener. She had three strikeouts and one walk. Picard owns an 11-5 record, ranking third in the AMCC in wins. She is second in appearances with 20, tied for third in starts with 17 and tied for ninth in complete games with nine. Her 2.97 earned run average and 82 strikeouts are seventh best. Mount Aloysius, 24-10 with 10 wins in its last 11 games, will play No. 6 seed LaRoche in the 10 a.m. tourney opener on the Penn State Behrend field at Erie Friday, with the winner to meet regular season runner-up and defending champion Altoona in the afternoon. No. 4 Pitt-Bradford and No. 5 D’Youville meet in the other first round game, with that winner to test regular season champ Penn State Behrend later in the day. The last two survivors of the double-elimination tourney will tangle Sunday at 10 a.m. If another game is necessary, it will follow immediately. SHIPPENSBURG — Clarion freshman Jessica Shomo (Clearfield) placed 10th in the long jump at the 10th annual Paul Kaiser Classic in Seth Grove Stadium Saturday. Her leap covered 5.22 meters (17 feet, 1½ inches). Shomo also ran the leadoff leg for the Lady Eagle 4×100-meter relay foursome that finished fifth in 50.26 seconds.